Chennai Super Kings 6-166 (Ravindra Jadeja 38*, Subramaniam Badrinath 34, Ravi Rampaul 3-31) beat Royal Challengers Bangalore 6-165 (AB de Villiers 64, Virat Kohli 58, Chris Morris 3-40) by four wickets. 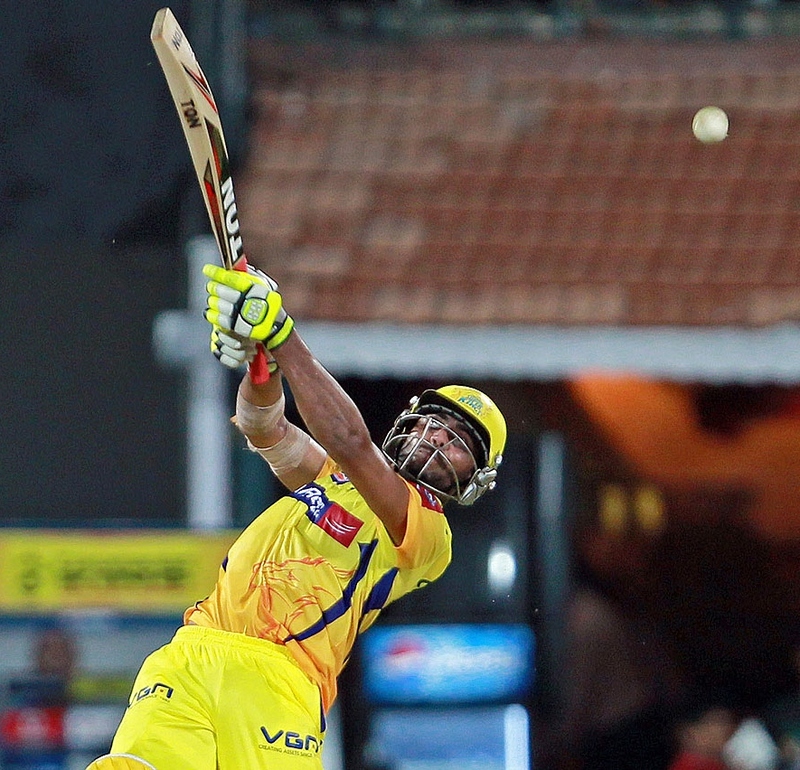 Chennai Super Kings snatched the important game against their strong opponents, Royal Challengers Bangalore, as Ravindra Jadeja sparkled in the final over. Royal Challengers Bangalore posted a reasonable score of 165 for the loss of six wickets in the required quota of 20 overs and Chennai Super Kings attained the target by plundering 166 with four wickets in hand and one ball to spare. Ravindra Jadeja (Chennai Super Kings) was announced ‘Player of the match’ for his timely aggressive innings. The 16th match of the Indian Premier League was played on Saturday, April 13, 2013, at MA Chidambaram Stadium, Chepauk, Chennai. MS Dhoni, the captain of Chennai Super Kings, won the toss and elected to chase while sending in the rival team to bat first. Royal Challengers Bangalore lost the most important wicket of their opener Chris Gayle who scored just four runs. Their skipper Virat Kohli got together with Mayank Agarwal who earned 2 boundaries in the following overs and the first had two as well. Agarwal was stumped smartly by Dhoni off Ravichandran Ashwin for 24 and was replaced by AB de Villiers who opened his account with a four. The score was taken to 74 after 12 overs and later the run rate was picked up by the duo as Kohli hit the first six of his innings while de Villiers added 4 fours. Kohli was dropped by Dwayne Bravo at his own bowling for 37 in the 16th over but was caught by Suresh Raina off Chris Morris after contributing 58 from 47 balls with 2 sixes and even fours. AB de Villiers took over from there and scored most of the runs as few wickets went down at the other end. He crossed his fifty runs mark in the 19th over with 1 six and 2 fours and was dismissed on the last over of the innings for 64 off 32 mere deliveries with 1 six and 8 fours. Chris Morris was the supreme bowler with three wickets whereas Dirk Nannes, Ravichandran Ashwin and Dwayne Bravo shared one wicket each. Chennai Super Kings was pushed back in the opening overs since they lost their openers, Michael Hussey and Murali Vijay, at 10 in 4 overs. Suresh Raina and Subramaniam Badrinath joined together and Raina opted to attack while dispatching 4 fours in the next couple of overs. Badrinath remained in the game by sending the ball out of the rope occasionally and the score was enhanced to 66 in 10.3 overs when Raina was caught by Murali Kartik off Syed Mohammad for 30 from 22 balls with 5 fours. MS Dhoni walked in next as Badrinath became the next victim after the addition of 12 runs to the total for 34 off 29 with 4 fours. Ravindra Jadeja associated with Dhoni and the first hundred of the innings was posted on board in the 15th over. The latter added another 13 runs to the score in the 17th over with 1 six and 1 four as Ravi Rampaul brought his team back in the game by getting two wickets in the 19th over. MS Dhoni was caught behind by Arun Karthik for 33 off 23 deliveries with 2 smart sixes and 1 four whereas Dwayne Bravo was declared leg before wicket for 8 runs. Chennai Super Kings required 16 runs to win the game from the last six balls and Jadeja gathered 10 runs off the first two balls with 1 six and 1 four. RP Singh overstepped on the fifth ball and that resulted in two runs as Jadeja took a single one and won the match for his team. The home side smashed 166 runs after losing six wickets in 19.5 overs as Ravindra Jadeja remained unbeaten for 38 off just 20 balls with 1 six and 3 fours. Ravi Rampaul was the star performer with three wickets, Syed Mohammad held two whereas Vinay Kumar claimed one wicket. Chennai Super Kings won the thrilling encounter on the last ball of the game and reached four points.